The two-time Olympic Gold Medalist Claressa “T-Rex” Shields will be turning professional on November 19th on the undercard of Sergey Kovalev and Andre Ward against pro debuting Franchon Crews, of Baltimore, MD, an eight-time USA National Boxing champion who lost in the 2015 Olympics Trials at light heavyweight. They fought in February of 2012 Olympic Trials when Crews was No. 1 with Shields winning 31-19 and 16 at the time. Shields should not be lost in the crowd of 10 bouts scheduled at the T-Mobile Arena, in Las Vegas, NV. The 21 year-old Shields will be moving up from middleweight to super middleweight. Now living in southern FL and training at Boca Raton, FL, after living her whole life in Flint, MI, she had a 77-1 record in the amateurs only losing in 2012 World amateur championships in China. She would go onto win the 2014 and 2016 World amateur championships. She won her first Olympic Gold Medal in London, England, defeating opponents from Sweden, Kazakhstan and Russia. In 2016 in Rio de Janeiro, Brazil, she won her second Olympic Gold Medal defeating opponents 3-0 from Russia, Kazakhstan and Netherlands. Shields also won the 2015 Pan American Games in Toronto, Canada defeating opponents from Brazil, Argentina and Dominican Republic all by scores of 3-0. She is only the third female boxer to be on the cover of Ring Magazine in their December 2016 edition. Shields is well represented by co-managers Mark Taffet and Jamie Fritz. Taffet who spent 25 years with HBO Sports and running HBOPPV since their inception in 1991, started his own company Mark Taffet Media leaving HBO in January 2016. Co-manager Fritz is president of Fritz Martin Management out of Las Vegas, NV, an Athlete Rep firm. Her trainer will be Leon Lawson who trained the Dirrell brothers, Andre the Olympic Bronze medalist in 2004 and Anthony the former WBC World super middleweight champion. “Claressa has incredibly broad shoulders and understands the responsibility that comes with her talent and her quest to lead the resurgence of women’s boxing. She is wise well beyond her 21 years. She believes the way to make a statement is to take on the best and show that women’s boxing is competitive, serious, talent-filled and entertaining,” said Mark Taffet. 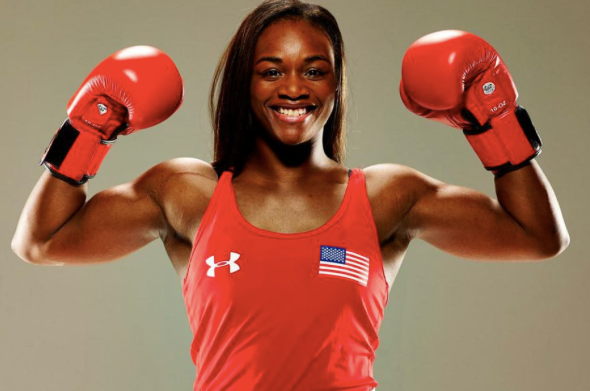 It’s this writer’s hope that the American people and those non-American fight fans get behind the two-time Olympic Gold Medal winner Claressa Shields. “She has a one-fight deal with Roc Nation for November 19th. She has not signed a multi-fight deal with any promoter. Claressa and her management team have had discussions with a number of promoters and will assess the alternatives which best fit her strategic goals following her November 19 professional debut,” said Mark Taffet. Shields once mentioned signing with Al Haymon or Golden Boy Promotions. Roc Nation has a one fight deal ahead of everyone. “Claressa arrives in Las Vegas on Monday and will be participating in a full array of fight week media activities. 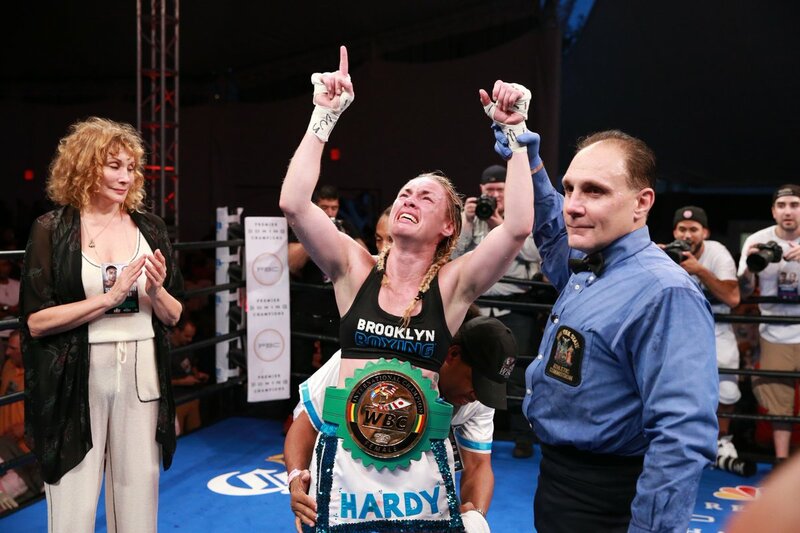 Hers will be the highest profile and most media-intensive female professional boxing debut ever,” said Mark Taffet. I had the pleasure of watching one of the best televised fights of the year this weekend. It went down at Coney Island and unfortunately was relegated to the NBC Sports Network. That’s too bad, because the brawl I witnessed between featherweights Heather Hardy and Shelly Vincent was an all-out war, comparable in action to the much applauded Conor McGregor – Nate Diaz UFC match a day earlier. Watching the tide perpetually change between Hardy and Vincent this weekend, I kept thinking how ridiculous it is for people to claim boxing is dead. For what went on at Coney Island was, for lack of a more academic term, terrific stuff. Truth be told, I’m not even sure who I think really won – though the decision went to Hardy. Looks like I’ll have to watch it again. 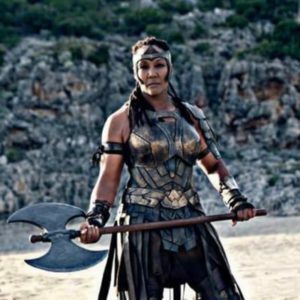 In the meantime, let me bring up another female fighter who deserves all kinds of praise now that the Rio Olympics have come and gone. For America’s Claressa Shields has now won not one, but two Olympic gold medals. What’s more, she’s the first American boxer, male or female, to ever do so. After being adorned with her second gold in Rio, Shields took the first gold medal she won out of her pocket (she got that one in London back in 2012) and placed it on her shoulders along with her newest hard earned prize. There she was, an American boxer, standing on the podium with not one, but two gold medals around her neck. If that doesn’t tell fight fans something, I’m not sure what does. Truth be told, female boxers have essentially told us fans these past few days that things aren’t always as bad as they seem. While it appears that many – though certainly not all – male boxers have taken to playing it safe, their female counterparts appear to be daring to be great. Back to Sunday evening. Engaging with “Boxing Twitter” while watching the Hardy-Vincent bout, I noticed fight followers doing something they aren’t generally apt to do – publicly show their appreciation for the combatants. The typical online snideness seemed to have vanished as Hardy and Vincent traded one shot after another. All that was left was a sense of “wow, this is a great match.” Someone even wondered in one hundred and forty characters why women fighters aren’t getting more exposure in the fight world right now. It was a good question. The sport really needs competitors like Shields, Vincent and Hardy. After all, action, and gold medals, go a long way.